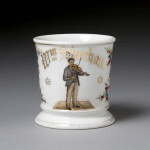 There are many types of collectibles in the antique advertising field. Listed below are many of the popular types of items collectors are searching for, there are of course others that are not included and if you’d like to help add more categories feel free to contact us. Each category below explains a little about what types of items are typically found and what is and isn’t included in the category. 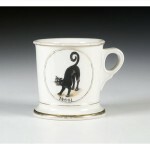 This category contains the most desirable of antique shaving mugs: Occupationals. The variety and intricacy of the graphics on these mugs are spectacular and there’s no doubt that they are highly collectible and very sought after. This category contains Fraternal Shaving Mugs, which are second only to Occupationals. They feature symbols or references to Fraternal Organizations, Unions, or other similar organizations. 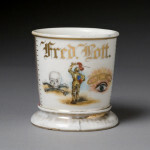 Decorative Shaving Mugs represent a broad spectrum of mugs, but essentially they are any decorated mug that isn’t an Occupational or Fraternal. Gold Name Shaving Mugs are the lowest and easiest to find of all shaving mugs. 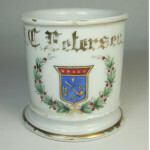 They were the cheapest option available to a person who was interested in getting a personalized shaving mug, the name would be available in several styles, from script, gothic, or block fonts in gold, black with gold highlights, or just black. Numbered Shaving Mugs were mugs that a new barber would order when opening their shop and would be used for customers who had not purchased a shaving mug of their own. They are simple mugs that feature a number on the front so that the customer would know they weren’t sharing their mug with others. Numbered mugs typically would be in sets from 20 to 30 in a small shop, but some busy locations had shaving mug sets numbered up to 100!